The story of Fleetwood starts with the explosion of the British blues boom of the late 1960's, the legend however, starts in Van Nuys, California in 1974. Drummer and band co-founder Mick Fleetwood was scouting studios and while checking out Sound City, Mick took a listen to an album that was recently recorded there by a duo by the name of Buckingham Nicks. Not long afterwards, Fleetwood Mac's guitarist Bob Welch left the band leaving a hole that needed to be filled. Mick returned to Sound City and asked about the guitarist he heard on the album that he listened to. Mick was told that the guitarist Lindsey Buckingham was a package deal, meaning if you take him, you take his girl as well. 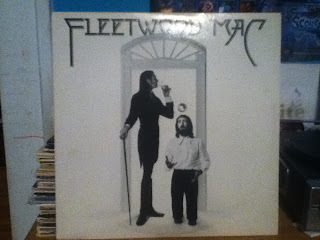 Mick agreed and so Lindsey and his girlfriend, Stevie Nicks joined this little known British blues band called Fleetwood Mac and brought on rock history. Fleetwood Mac's self titled album is actually the band's tenth album and is often referred to as the "white album" to avoid any confusion with the band's first album of the same name. Prior to the new line up of 1975, none of Fleetwood Mac's prior albums broke 400,000 copies sold in the united states. Not only did this album break five million copies sold by 1976 but it also launched the band into rock stardom, putting the band in charts for both rock and adult contemporary charts. However, what was a huge success here in America was mostly ignored in the UK until the release of 1977's Rumors. Rhiannon, Over My Head and Say You Love Me were the only singles originally lifted from the album, all three scored high on the singles charts, but songs such as Landslide and Monday Morning would have success years later as singles and tracks from the entire album continue to get regular air play thirty-eight years later.